Amber Hoshiyaar Novel Ambar Naag Maria Maut Ka Taaqub Ki Wapsi Series part 100 authored by A. Hameed. Ambar Naag Maira Maut Ka Taaqub Ki Wapsi series contains 100 complete novels. All novels of this series promote amazing historical fiction stories for kids in Urdu language. Story of the five thousand years’ journey of the return of Naag Maria and Ambar. Maut Ka Taaqub Ki Wapsi series gripping on full suspense, action, adventure, horror, mystery and fantasy for children. The main theme of this series is based on grandeur and heroism. Amabar Naag and Maria series divided in 3 miniseries as mentioned below. 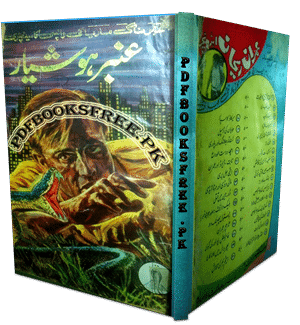 Urdu kids novel “Amber Hoshiyaar” Ambar Naag Maria Maut Ka Taaqub Ki Wapsi Series part 100 is now available on Pakistan virtual library for online reading and download. Check out the following links to read online or download Maut Ka Taaqub Ki Wapsi series part 100 in Pdf format to enjoy offline reading. Saeed bhai, there is mistake in link for download. It download Sabri ke azdahaa rather than Amber HOSHIYAAR. Walekum Assalam, Dear Muhammad Arshad, download link has been updated. I am sorry for this mistake. Sir Download link Sahi nahi hai, part 94 download ho rha hai. Download link has been updated. You may download now please. Thanks and really appreciate the hard work and effort you are doing to bring this legendary tale back to us. Mere Pas PC Nahi Hai Main Mobile Pe UC Browser Se Books Download Karta Hon File Download To Ho jata Hy Magar Open nahi hota open karta hon to damage or currupt ka msg aata hy. main kya karon mobile pe kis tarah download karon? plzzzzz help me. Ajaz Bhai, app us browser se na karen. koi aur browser use karen.